The Virginia Institute of Marine Science has announced the winners of its 15th annual photo contest, an in-house competition held to recognize and honor the most captivating images taken by VIMS faculty, students, and staff during their scientific work in the field and laboratory. The first-place winner for 2014 is REU Intern Dave Matthews, for his haunting image of a derelict ship on Virginia's Eastern Shore. Matthews, a student at the University of Massachusetts at Amherst, took the photo on a stormy day in late May during an REU field trip to VIMS' Eastern Shore Laboratory and nearby barrier islands. 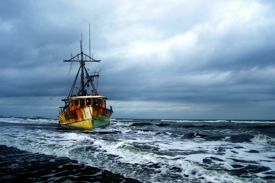 The vessel is a fishing trawler that ran aground on the south end of Cedar Island near Wachapreague Inlet while enroute from New York to Central America to be refitted. During his time as an REU student at VIMS, Matthews collaborated with Professor Rom Lipcius to investigate the degree to which ribbed mussels affect growth patterns within Spartina salt marshes. 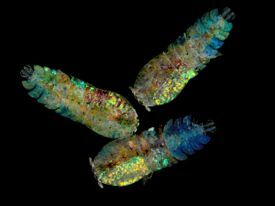 Taking second-place was Master’s student Jami Ivory, for her photo of a trio of copepods from the family Sapphirinidae. Ivory took the photo of these living copepods—each about the size of a rice grain—using a dissecting microscope aboard the research vessel Atlantic Explorer. She collected the animals in the open ocean near Bermuda, as part of her thesis study of seasonal cycles and year-to-year variability in the abundance and distribution of major groups of zooplankton at the Bermuda Atlantic Time-series Study (BATS) station. The third-place winner was graduate student Erika Schmitt for her photo of summer intern Theresa Brown and fellow grad student AJ Johnson carrying sampling quadrats back to the RV Scoter during a survey of bay scallop populations in South Bay on the Eastern Shore. 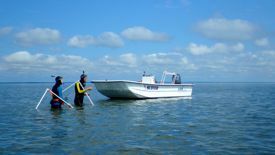 Their research is part of a long-term effort to restore a viable bay scallop population to seagrass beds that were themselves restored to the area by researchers at VIMS and other institutions. The seaside's population of bay scallops had been functionally extinct since 1933; VIMS scientists began their efforts to re-establish the population in 2009. Donglai Gong—a VIMS graduate student holds a sea star dredged from a rocky bottom area. Stephen Manley—common blowfish (Torquigener pleurogramma) swim over newly planted seagrass (Posidonia australis) in Cockburn Sound near Perth, Australia. Stein says that she "always appreciates the efforts of those who submit their photos to our contest," and notes that VIMS uses photo-content entries to help illustrate its print publications, outreach materials, and website.